Authors, Speakers and Coaches check this out! Save thousands of dollars in joint venture VIP membership fees? Introducing JVattraction.com, a favorite online community to build profitable relationships with successful, generous members. These active members are ready to promote your book or product, co-author a book, become your product affiliate partner, interview you or have you guest blog. Become a free member and getting weekly tips on how to create profitable products and coaching programs. 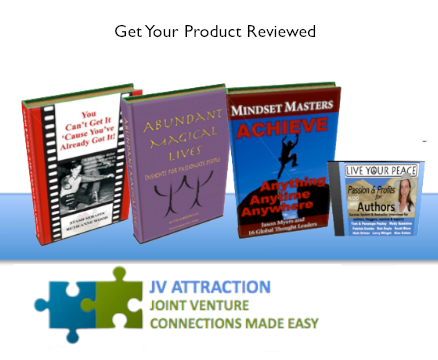 Connect with an engaging online community with ideal coach, speaker and author joint venture promotional partners at JVattraction.com. Do you really want to impress these superstars and ideal promotional partners just waiting for the right product to share or promote to their communities? Email us your completed “Get Your Product Reviewed” application. We’ll work together to create a crystal-clear vision of the kind of profitable products to create or tweak to build a marketing system and engaged community of buyers and raving fans. You’ll uncover technical, marketing or mindset blocks that keep you from creating a thriving, profitable business around your much needed and desired products and services. And you’ll leave the session renewed, reenergized and inspired to finally step into your legacy as a thriving author and coach in your community of students and clients once and for all. Email us your completed “Get Your Product Reviewed” application to get started.